This made me think of Gail Zahtz and the day I met her. You might have seen Gail’s writing recently she putting out some great blog posts and is launching a new tweetchat at 1pm eastern on Tuesday called #cphc or carpool health chat. I have been having trouble keeping up with her in creative mode. I think I am even somewhat jealous. See this month is January and I know something about myself in January. I am sad. I will be sad probably for another month. I am always sad this time of year. My spirit ebbs and I desperately want the energy that comes with spring and renewal. I will plow through this time painting and doing my best to comment and to write, but life is lived as a walk through molasses. So let us go back to May 2012, to light and life and fresh flowers. 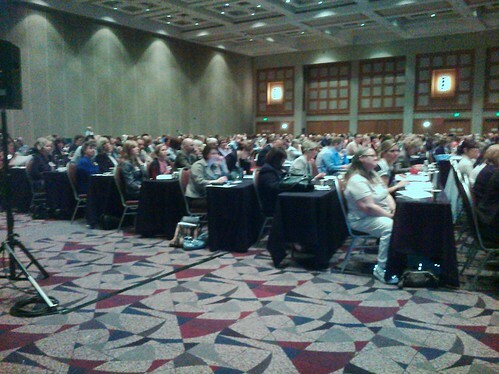 On May 7-9th I had the honor of attending the ICSI Institute of Clinical Systems ImprovementColloquium in Minneapolis, Minnesota. Gary Oftedahl, chief knowledge officer of ICSI, invited me. He joined the gallery prior to the event and I brought his jacket with me. His jacket is entitled “The Two Paths.” I made the two paths function both as roads and as hands in supplication. On the left hand side, patients and doctors are working as a team. On the right doctors are at a distance and often on a pedestal. But there is hope. Some doctors from both sides are reaching out to each other in open communication. Gary liked it and told me I was free to paint in any session I wished. 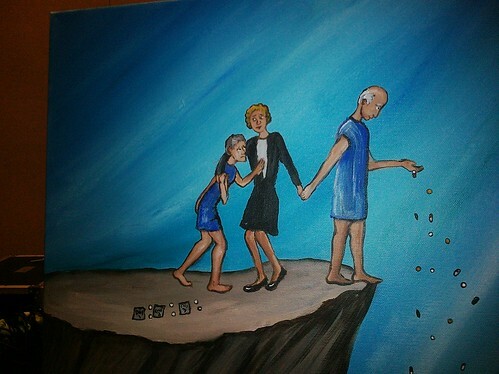 This painting tells the story of when Brian met Edward and Sharon Jungbauer. Edward was a two-time kidney transplant recipient, has had two hip replacements, diabetes, hypertension and several other conditions. When Brian and his students met Edward he was on so many types of medication it was hard to understand what Edward was taking. Brian and his student team helped consolidate the list and make it much more manageable. So in the painting Edward stands on the brink of a cliff. His pills are dropping into the hands of the students as Brian the scholar orchestrates their distribution. Whilst this is going on, Sharon is trying to help her sister. Her sister has been sent home with poor instructions for care and is in the process of overmedication. Fortunately Sharon realizes something is wrong and gets help. 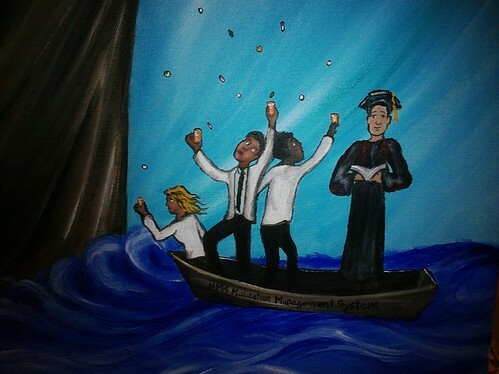 Brian loved the painting and it currently hangs in his office in Minnesota. 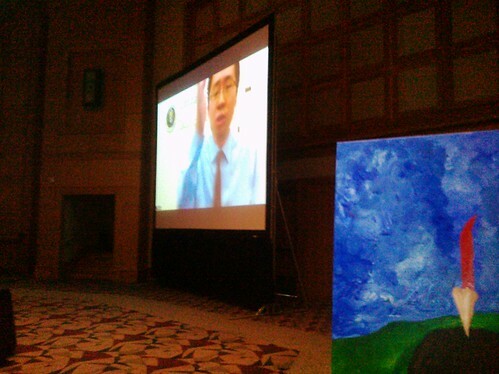 On May 8th I began the second painting, “ The Lone Nut.” I began this painting in the main assembly hall as we tried vainly to follow Chief Technology Officer of the United States Todd Park present a keynote speech using Skype. (He was supposed to be there in person but the Office of Business and Management had recently directed a 30% reduction in the federal travel budget.) It was painful and somewhat ironic to watch. The audio did not sync and it was very hard to understand his presentation. The audience made up of mostly of residents of the great state of Minnesota sat stoically through it all with only a few murmurs of complaint. During this I began painting the stylized pencil logo of the conference. Soon we went into sessions and I split my time between tracks 3) Patient Engagement/Consumer Experience and 4) Integrating Behavioral Health and Primary Care. 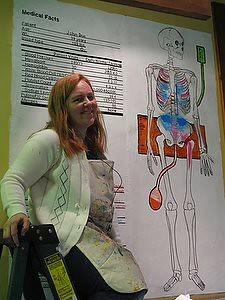 I was the only patient in the room in quite a few sessions and even though I was painting frantically, I asked a question in virtually every Q&A. I was getting rather angry as the day wore on. I messaged Gail Zahtz who lived in the area and asked her to drop everything and please come to the event as I could not paint, tweet and ask questions all at the same time. Within an hour, she came to the conference. I painted her Walking Gallery jacket and was going to give it to her as soon as she arrived. Her jacket is entitled, “The Big Girl.” Within the painting I reference the nursery rhyme, ”There was a little girl, who had a little curl, right in the middle of her forehead. 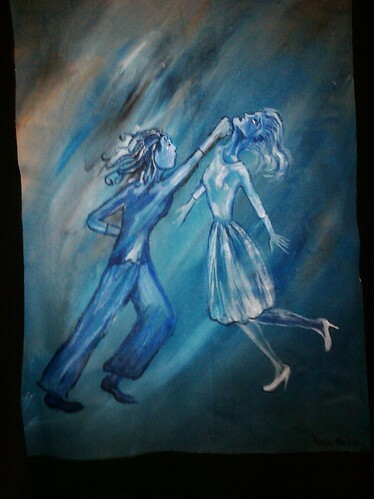 When she was good, she was very good indeed, but when she was bad she was horrid.” The painting describes a scene where her teen “bi-polar” daughter hit Gail causing an injury to her face. Gail is one of the few members of the gallery to join with a behavioral health story. When Gail saw her jacket she cried and we hugged for the first time. The lone nut in my painting became a native Oklahoma pecan with its shell cracked. The face of a woman of color peers out of the shell casing. Her dreadlocks are roots and her eyes seem half open. She is the diverse and disadvantaged population I would hear so much about in the sessions that followed. She was the color in that sea of white faces. 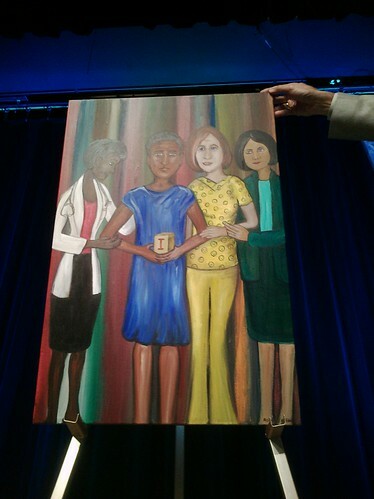 Without her inclusion there is no growth or change. She is the seed for the care of tomorrow. Above her and beneath the ICSI tree a few patients stand. To the right a mother holds her child up to the tree. He reaches out to grab a hash tag apple. How can he learn the message of better health if it is not shared through open media? To her left two men stand arm in arm. One of the presentations focused on the use of the PAM- Patient Activation Measure. As I recently studied the ACES- Adverse Childhood Experience Study, I enquired as to whether they were using both measures to help patients. They said they were not. I hope they reconsider, as I do not think we truly appreciate the patient’s now without understanding their past. 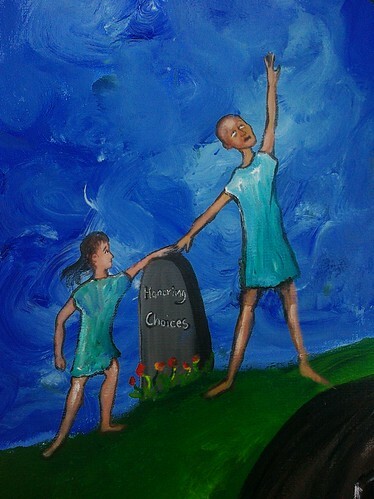 To the far left of the painting a child and a patient who is suffering from cancer stand beside a tombstone. The stone is etched with the phrase Honoring Choices. This is an amazing campaign in Minnesota. Honoring Choices is a documentary series. PBS teamed with the local hospitals to create it and due in part to that work, Gunderson Lutheran Hospital has one of highest rates of completed advance directives in the nation. 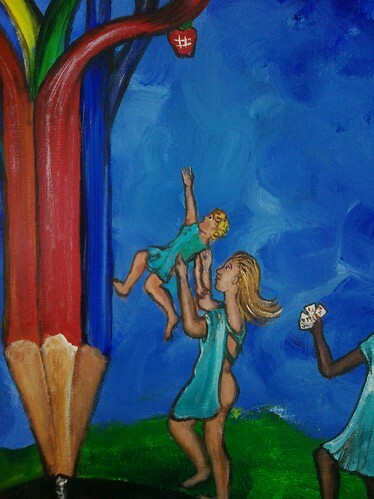 On May 9th I painted the final painting while Gail helped by tweeting. 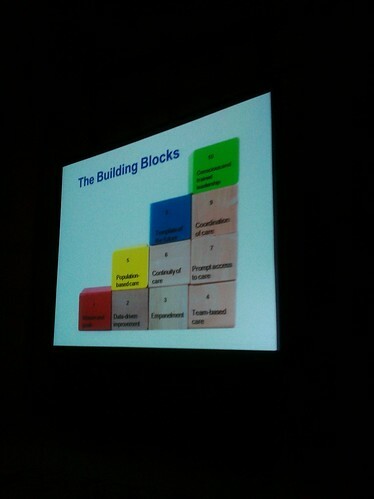 Tom Bodenheimer, MD, MPH, FACP, from the University of California San Francisco (UCSF) did a presentation on the building blocks of care. 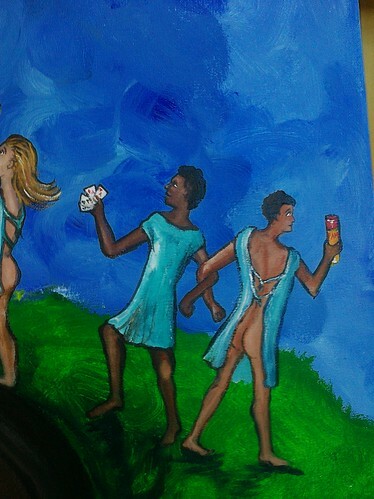 I based the next painting on a slide from his deck. Here the patient holds his block within his hands. Around him are providers. To his right a nurse embraces him. She is a patient too. For if you look closely at her blouse you will see all the happy faces turn to sadness, though the overall color of yellow masks it well. Soon after finishing the painting, I presented before the crowd explaining the paintings of the last two days and even gave a humorous interpretation of the content of Todd’s Speech. I tried to convey his amazing energy and passion, but I think I only succeeded at frightening a few people. 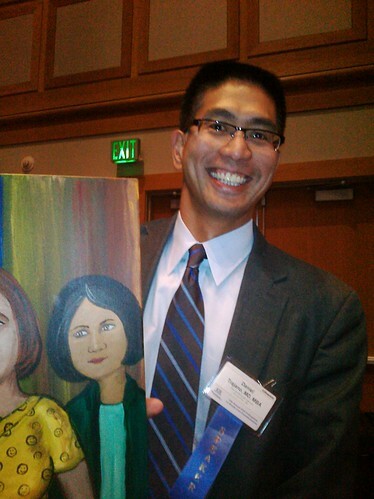 At the end of my presentation, we auctioned off the painting “The Care Team.” Daniel Trajano, MD Senior Director of Quality and Care Innovation at Park Nicollet Health Services won the painting. Soon I thanked Gary for the honor of presenting. Then I hugged Gail goodbye. I left her embrace a little braver, a little more willing to speak of the sadness that assails us all. Imagine a society where your device is never far from your hand. No matter how important you are or how low, you never go out socially without your technology. The line between work and personal life is hopelessly blurred. You cannot even take your kids to the park without pulling out your device and following the most recent thread. Does this sound like our wired society in 2013? Well, I am actually describing the world of the average woman in the Middle Ages. Back then every woman, regardless of age or rank, was expected to fill their day with meaningful work. So each woman would carry their spindle and distaff (also called a rock) with them to social occasions. Sometimes they would even gather for this purpose and it was called “a rocking” I guess the modern equivalent of that would be a “tweet-up.” It was a constant frenzy of thread creation. But there were times that it was considered appropriate to put down the spindle and focus on friends, family and spiritual well being. People would “unplug” (Or would that be unlace?) 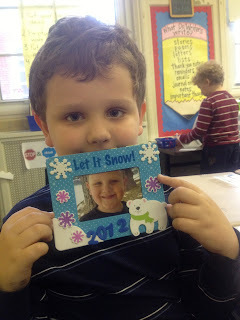 during the 12 days of Christmas. I don’t know about you, but I see a pronounced absence of social media voices during the holidays. Other than the occasional status update or twitter competition most folks are MIA from December 25 to January 6th. Perhaps that is exactly the way it should be. Perhaps the holidays are time focus on family and friends and spin stories rather than messages in the media. But today is January 7, Distaff Day. Today we pick up our devices once more and we will spin the threads that will make this year. Those threads will form the weft and warp of healthcare policy. 2013 will be an amazing year in healthcare and patients must be in the forefront of creating that message. I look forward to following your threads. On December 20th I walked upon the streets of New York. I had just checked in to my hotel room. It was small, just enough space for a bed. 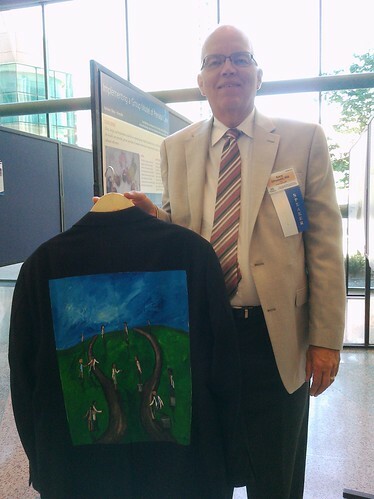 I changed into my Walking Gallery jacket and left for the gala. Alex Fair and folks from the NY chapter of Health 2.0 were going to sell art in the hope of help raising money for charity. As I walked down the street, darkness fell. Vast piles of trash bags lined the avenue. My footsteps echoed on the wet pavement people were rushing home from work and school. A big sister walked with her little sister. Then a caregiver guided a child with autism past a looming bin and passerby. I looked for the club where we were going to host the gala. Columbus 72 was a small club sandwiched between many buildings. I went down the steep stairway into the basement of the bar. For a night it was to become a winter wonderland. Paper snowflakes and lights filled the air and structural poles were beribboned like candy canes. Across the room, I saw Alex Fair in his winter themed red and white sweater. He greeted me with a smile and a hug. The club was just finishing up a start up health incubator. 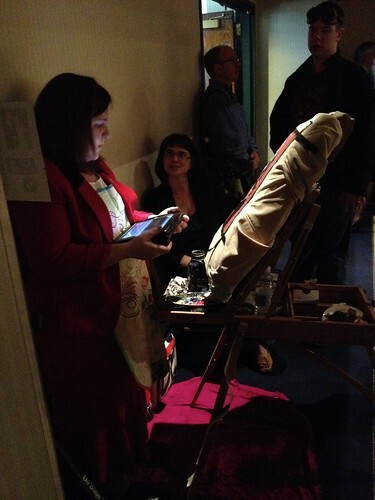 People filled the room as I pulled out two paintings that I bought as additions to the auction. The room was filled with the large pieces from the UN non-communicable disease summit of September 2011. 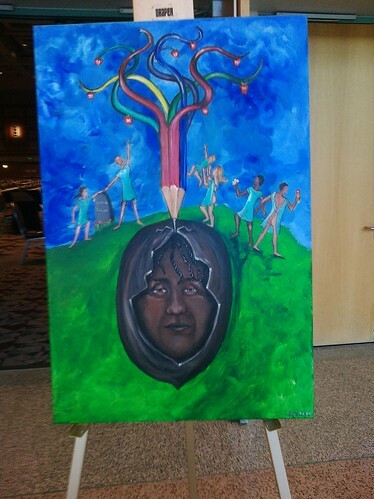 The works of multiple artists were on display and we were tweeting under the hastag #HIball. 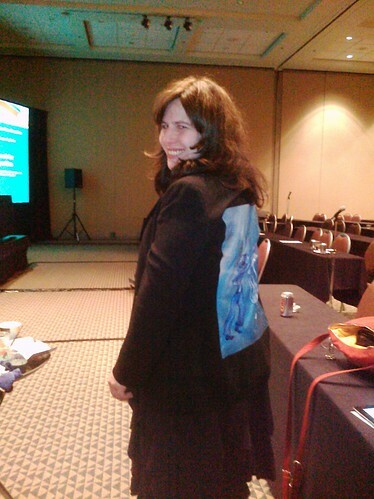 I also brought The Walking Gallery jacket for Esther Dyson. Esther soon showed up and I smiled as gave her the jacket. Then Brian Sivak CTO from HHS arrived. Esther was our moderator as we talked about the future of healthcare. I was surprised when I began to speak how a few members of the crowd were willing to be quiet. Even with the microphone it was quite challenging to be heard as the crowd drank, ate and conversed over our words. Esther and I asked people to please be quiet so others attendees could hear. Esther did a great job explaining what was going on in cutting edge health. Bryan focused on the future of current measures at HHS. As we wrapped the conversation, I asked the crowd if anyone would be willing to save a life. In the few seconds of quiet after the question a few hands shot up. I followed the question up by explaining an individual who would be an organ donor would need a care partner in New York. If he could get a care partner he would be able to save another’s life. I was so happy to see several people come forward and express their willingness to help. I happy to report he now has a care partner. Soon the art Auction began. John M. Luke Jr. from Storage Wars New York was the auctioneer. He and I exchange some comments. I explained that I had spent my youth working in flea markets and was quite comfortable with the work of helping an auctioneer. We worked side-by-side, I explaining the art as he began the auction process. 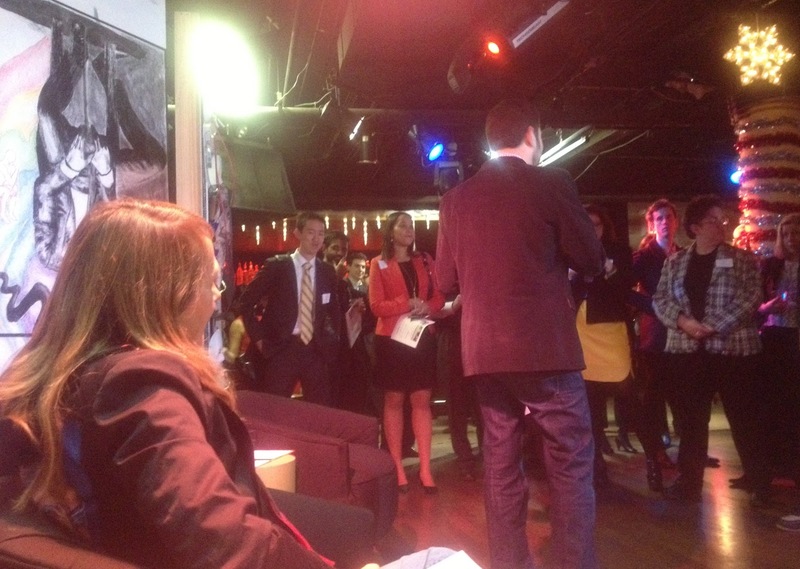 The room was full of individuals working for start-ups, grad students and people working in health tech space. There were not a lot of high dollar folks in the crowd, so a great deal of the art was sold at affordable prices. My only concern was the loudness of the conversations in the room. I didn't think most people could hear what we had to say. I did ask them many times to be quiet and listen. I found it so funny that adults were having trouble learning the lessons of a preschooler. We did manage to sell the majority of the art which was great in itself as the art had been in a storage locker in New York for the past year. I also was honored to meet Walking Gallery member Wen Dombrowsky's husband whom I had heard so many wonderful things about. I took a picture of them together. I met some lovely people in New York who are working on healthcare. 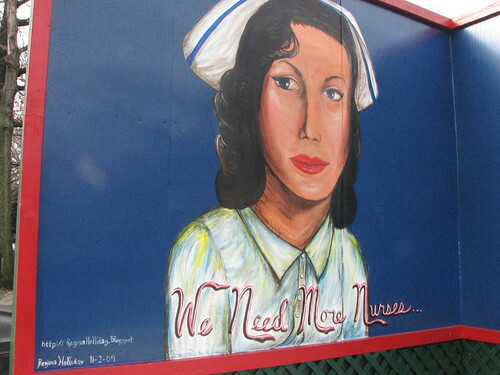 I thank Alex Fair from Medstartr so much for us all he did to get the art out of storage, auctioned and delivered. This precious art could've been thrown away or destroyed, but was saved because of this caring and loving man. As the evening festivities wrapped up, I left the club and went back into the New York night. I went back to my small hotel room and slept. In the morning the weather was poor. In the pouring rain and winds, I tried to hail a cab but was unsuccessful. I went back into the Comfort Inn hotel where I was staying. The lovely front desk clerk named Penny called car service after call service. No one was taking fares. Finally she called a driver she knew and he said he could take me to Penn Station. I caught my train and got back to DC in time for my younger son's Christmas party at school. I was so glad that the art gala saved some art from destruction and so glad I was able to make new friends and visit old ones.